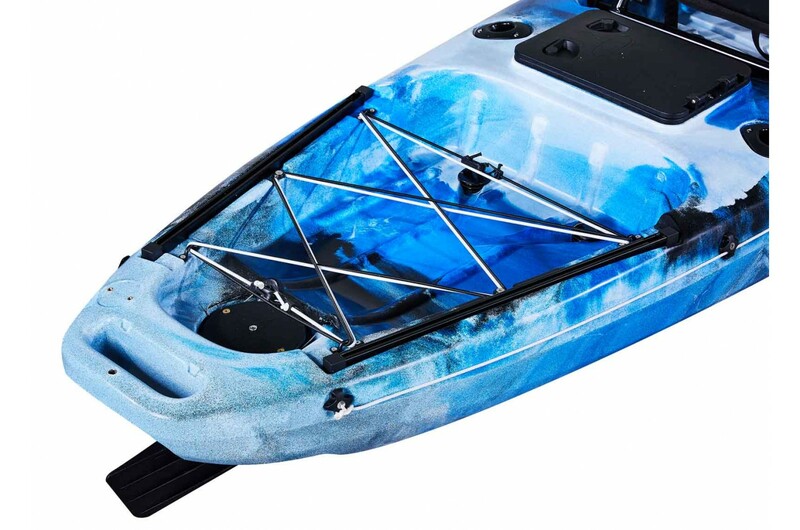 Are you a kayak fishermen that wants a dedicated pedal kayak? 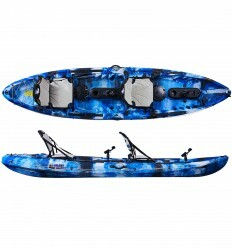 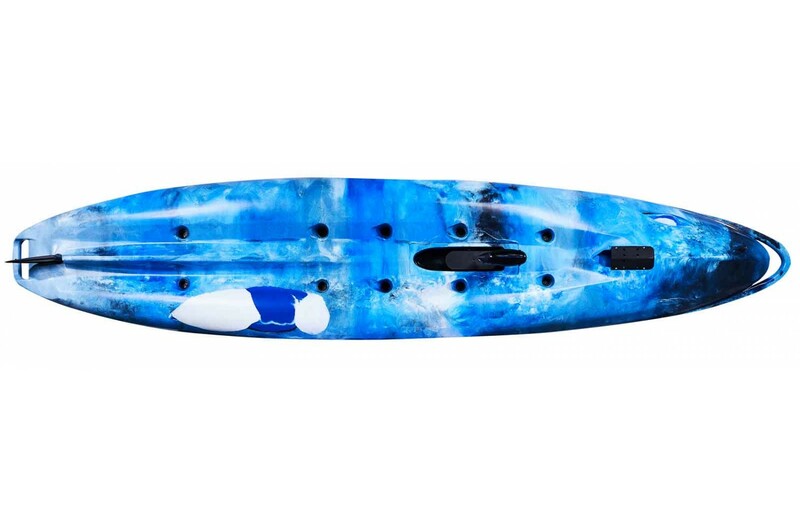 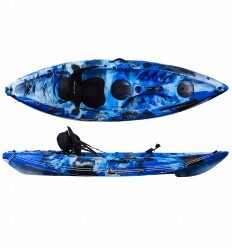 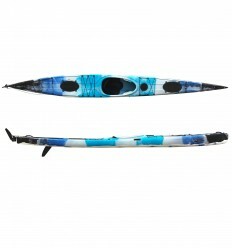 The new Supernova from Galaxy Kayaks is our top of the range pedal kayak that is ready for your next big catch. 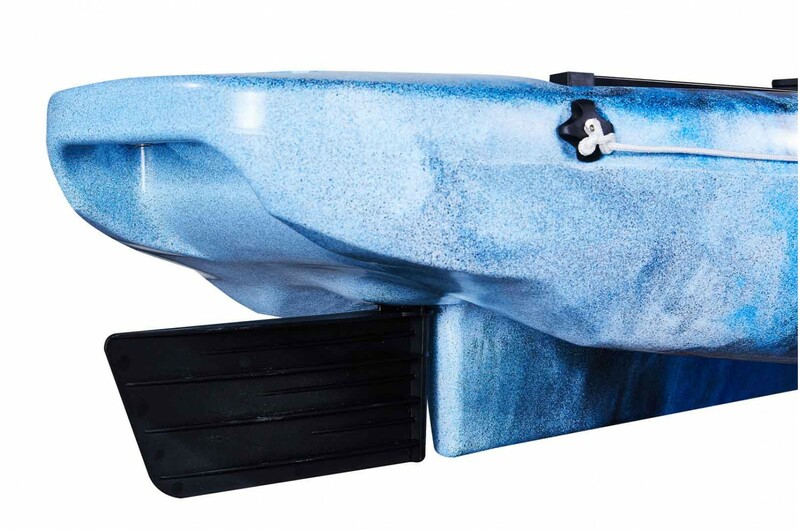 This model is part of our new Galaxy HV Series™! The Galaxy Supernova uses the dedicated Cyclone Pedal Drive to power the kayak both forwards and backwards with absolute ease. 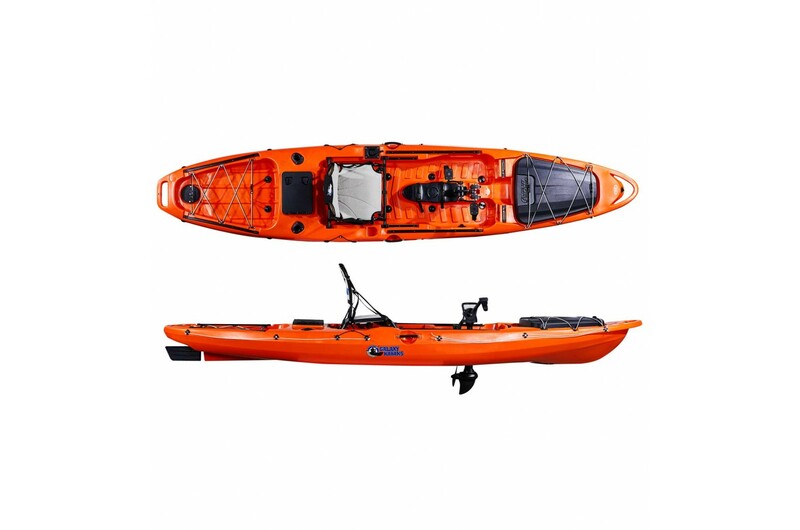 The cyclone drive is anchored to the kayak on a front hinge that allows you to lift it in and out of the water comfortably. 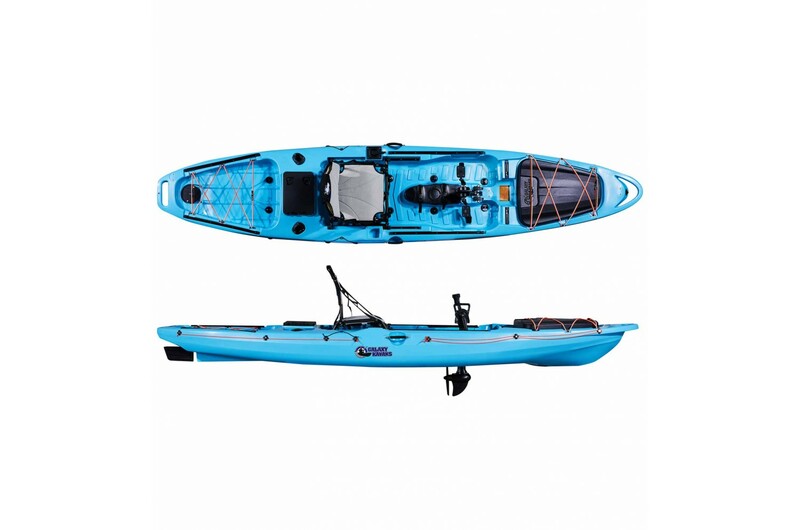 Using our Cyclone Pedal Drive means you can enjoy the benefits of hands free kayaking and be able to use your fishing rod while positioning your kayak nice and quietly. 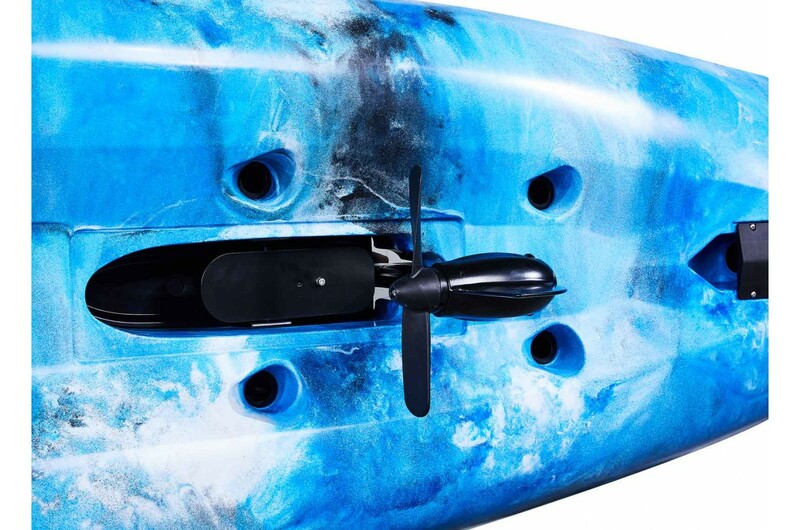 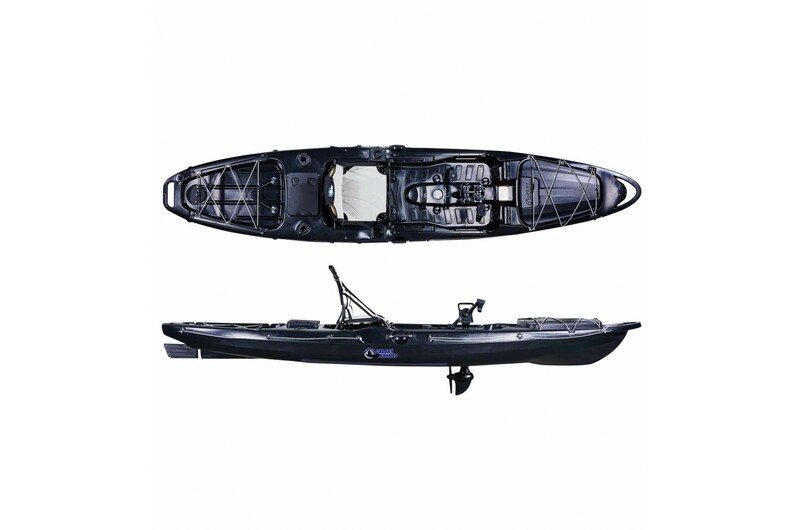 The Supernova is a large pedal kayak that measures 397.5cm in length by 85.5cm wide and 48cm high. 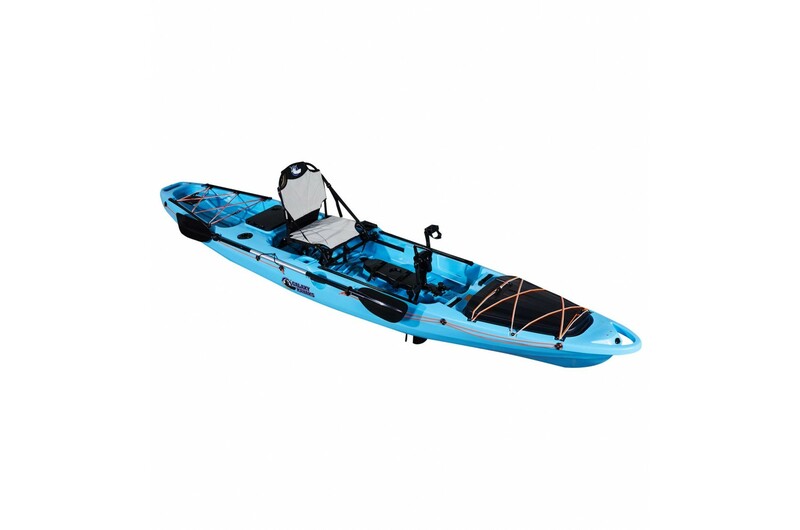 By being a larger kayak you gain on two key elements: stability of your watercraft and its cruising speed. 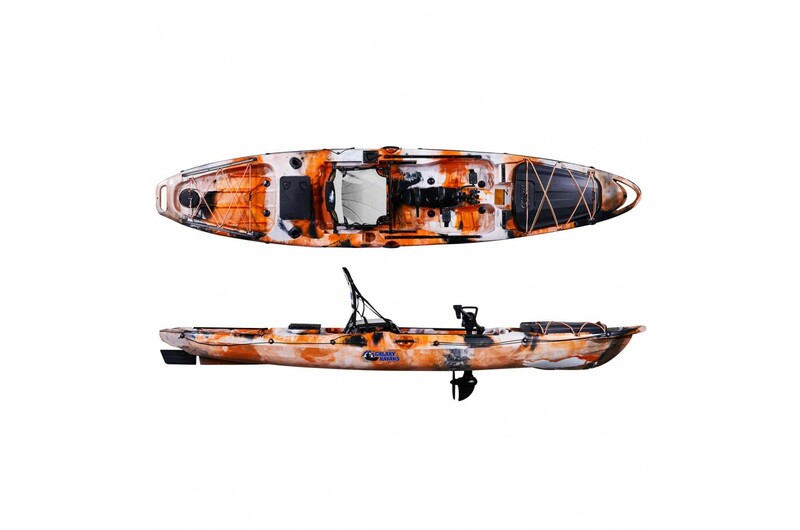 The shape of the hull makes this a very stable craft which is ideal for tackling your favourite sea, lake or river or even for those stand up fishing sessions wherever you prefer. 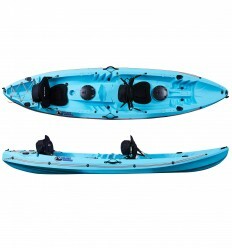 The kayak comes with loads of great features as standard. 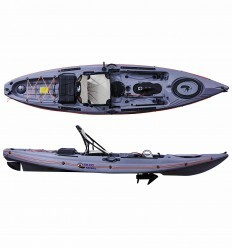 There are six rails found throughout the kayak, two small ones in the front, two large ones on each side and two medium ones in the rear of the kayak. 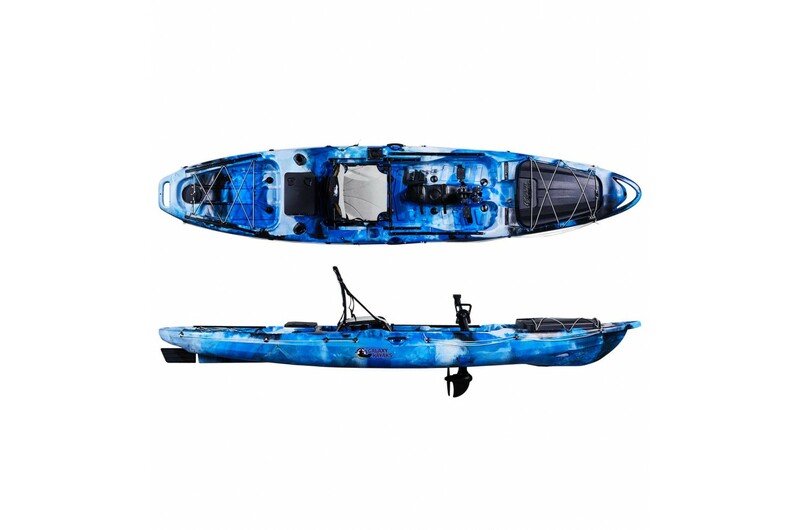 This allows you to attach a huge range of accessories, such as Railblaza Rod Holders, Camera Boom, Visibility Kit or your preferred Fish Finder. 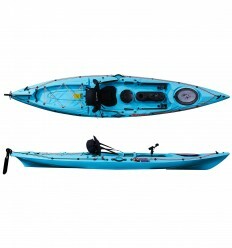 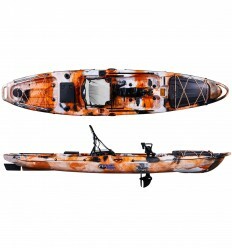 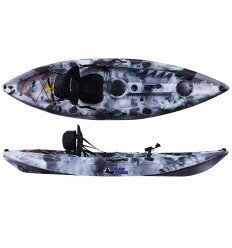 Using this kayak for trawling is great as it comes with two flush mount rod holders. As this is a larger pedal kayak it means it will stay at that nice cruising speed for a good old trawling session. 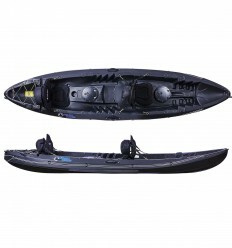 Storage space is so important on a fishing kayak and The Supernova also has plenty of it. 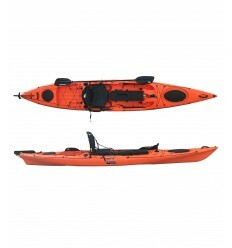 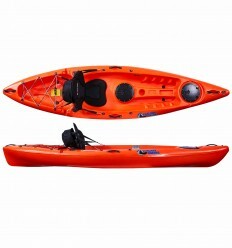 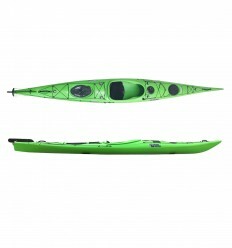 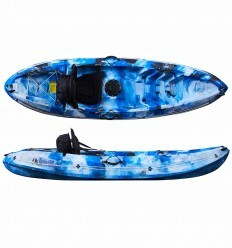 This kayak comes with a large front hatch and a large rear storage area. 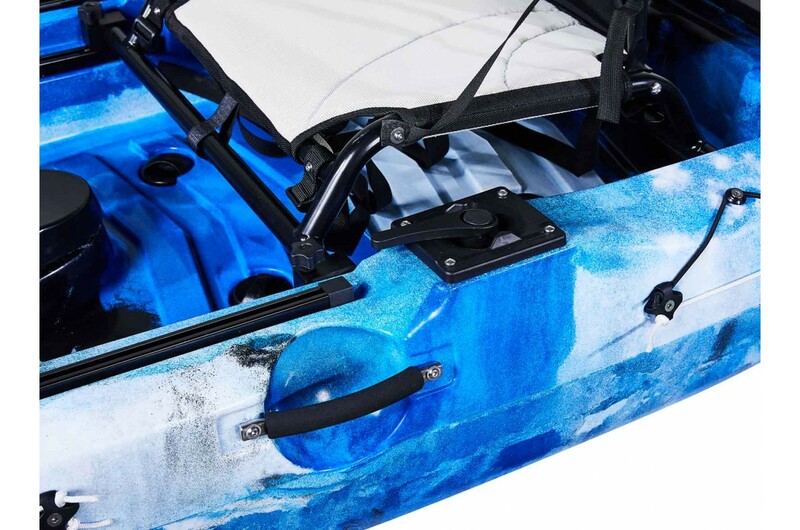 Both areas have bungees so tying down or attaching things like our Storage Pod in the rear is made easy. 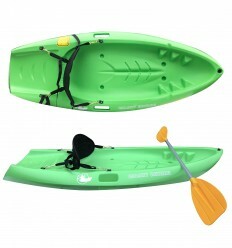 The kayak also has a rear storage hatch, located just behind the seat, which measures 31 x 21 x 19 cm. Being a larger kayak, we felt making it easy to transport was a top design consideration. 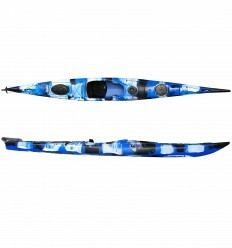 The Supernova comes with moulded handles in the bow and stern of the yak. 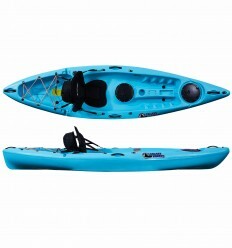 It also comes with heavy duty side handles which come with rubber non slip grips. 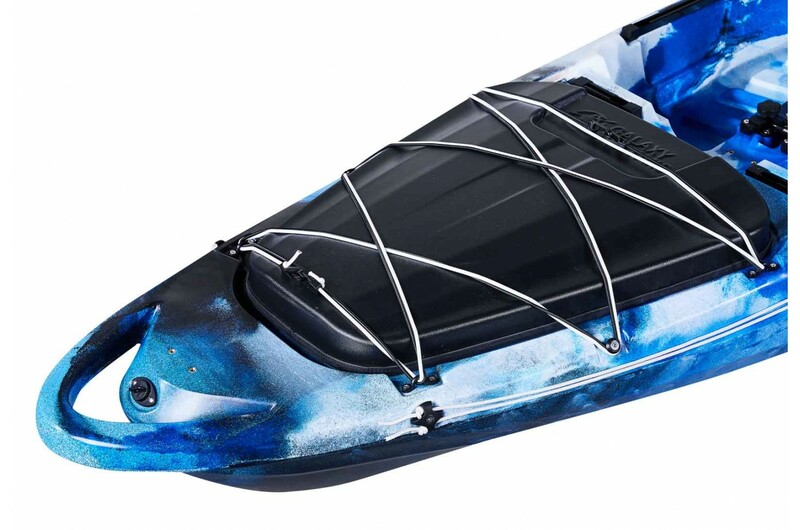 Finally, security is always the number one priority when kayaking so like many of our models we have added a lifeline throughout the kayak just in case the worst should happen. 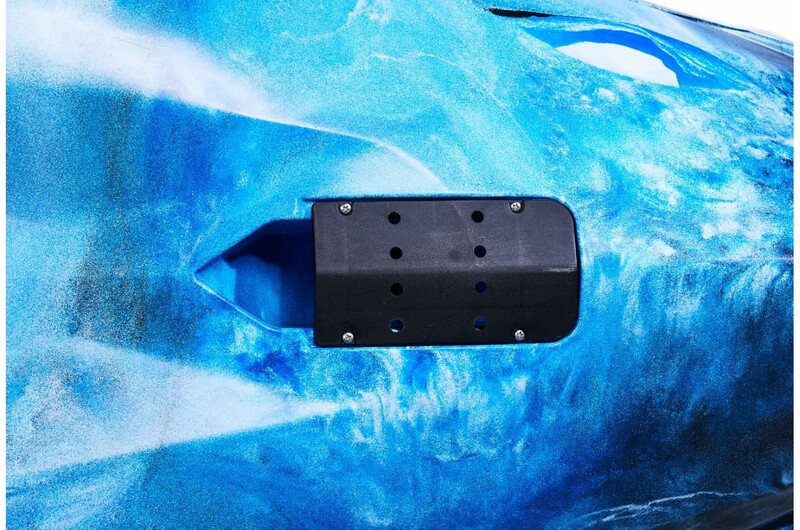 This also adds a number of possibilities when clipping gear or anchoring of your top spots. 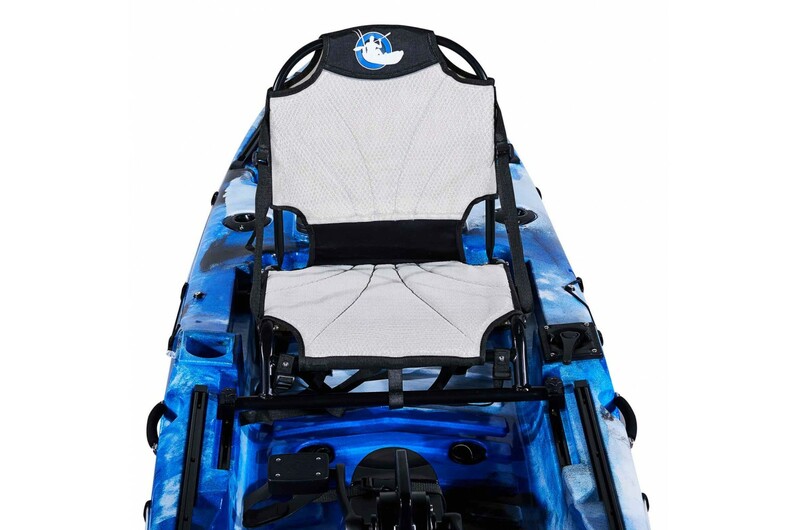 equipped with a Vista Supernova High Seat. The kayak also comes with a paddle as standard so all you need is a lifejacket, and you are ready for your next adventure! 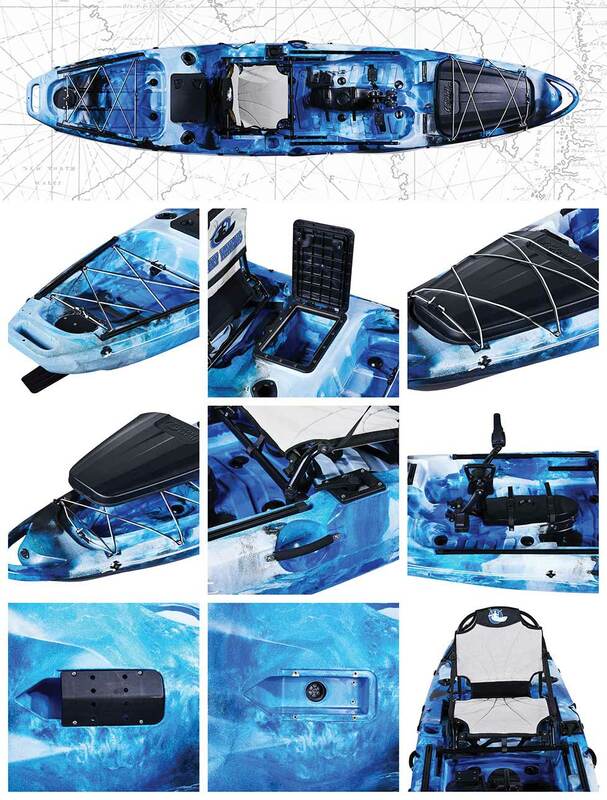 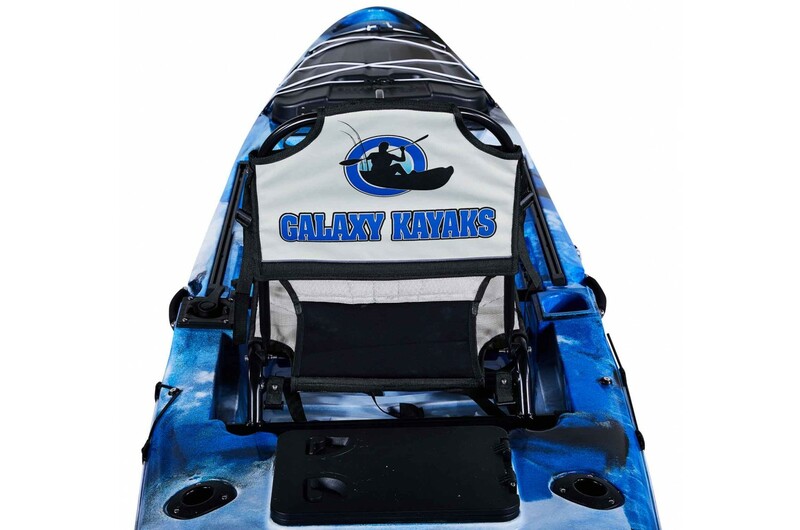 • If you want more reasons to trust Galaxy Kayaks please read Why Choose Galaxy Kayaks? 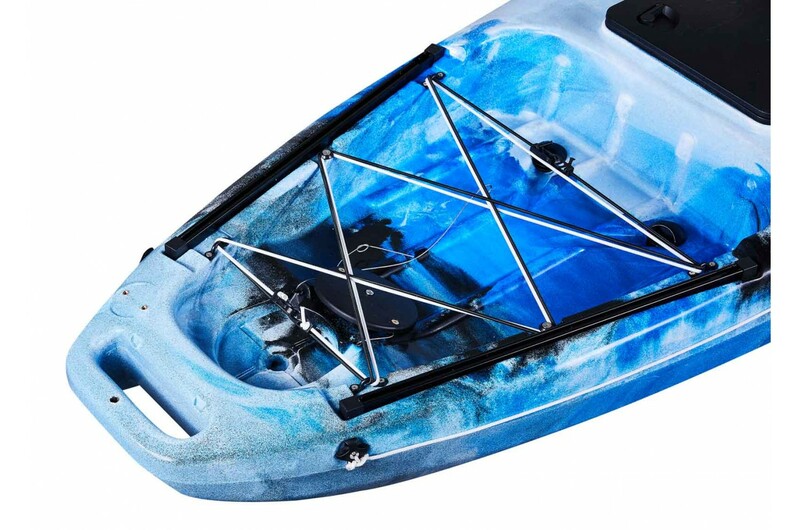 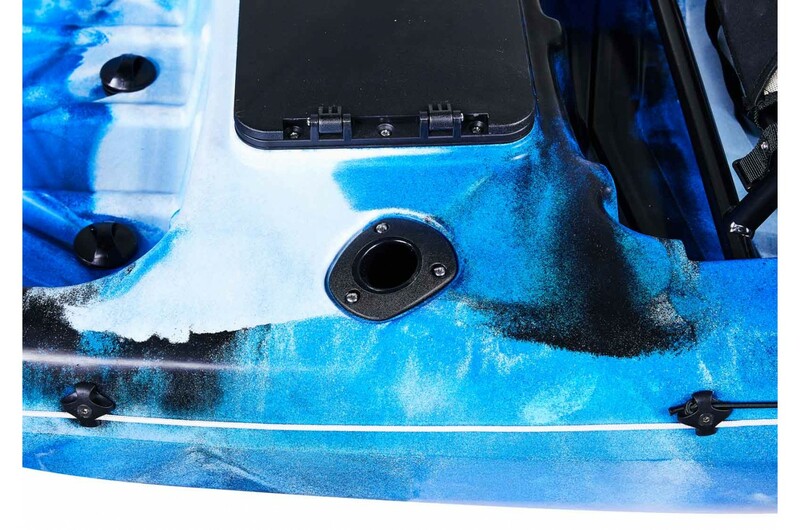 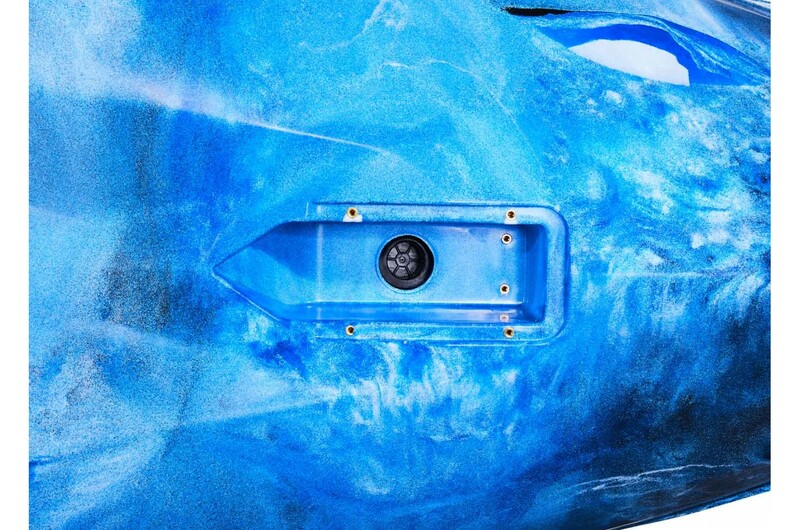 1 transducer compartment with protective cover: located in a scupper plug hole on the bottom of the kayak. 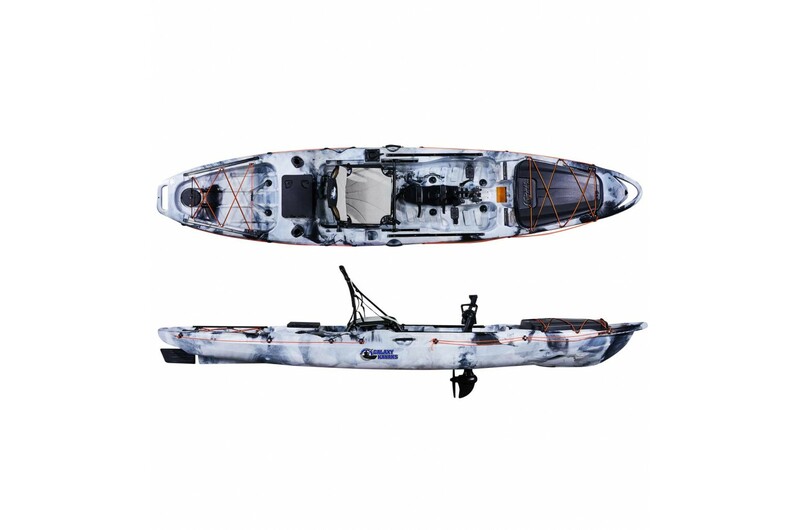 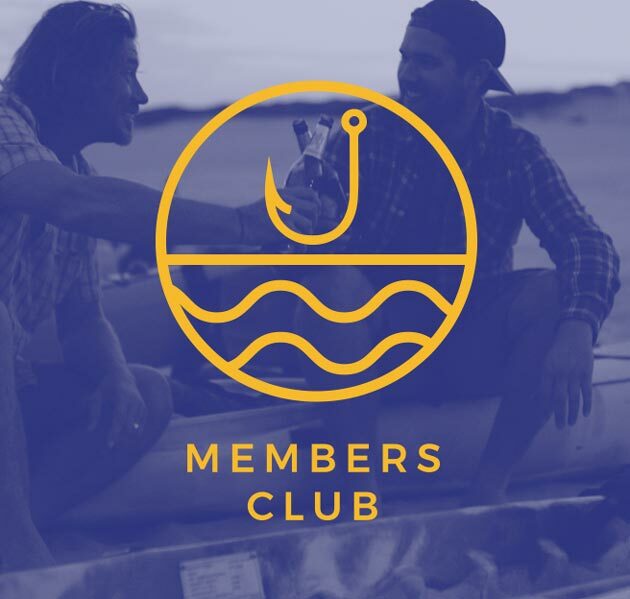 This means you can fit the transducer under the kayak in direct contact with the water and easily pass cables through to your fish finder whilst keeping the unit safely protected. 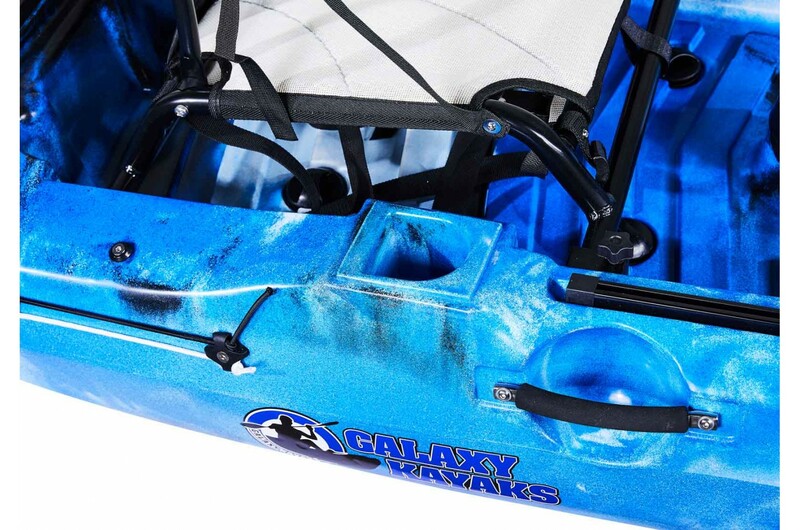 No DIY necessary - Galaxy Kayaks are ready for you, meaning you can spend more time out on the water. 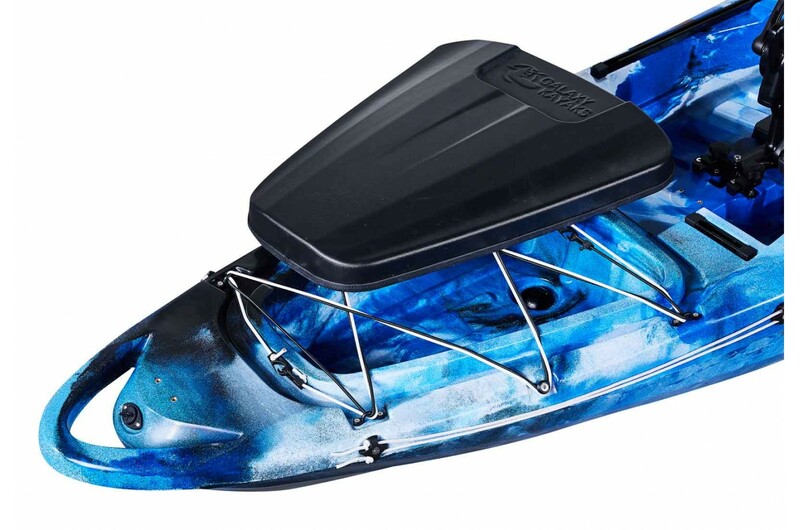 1 Cyclone Pedal Drive: with a propellor ratio of 1:10, this pedal drive is built specifically for the Supernova kayak. 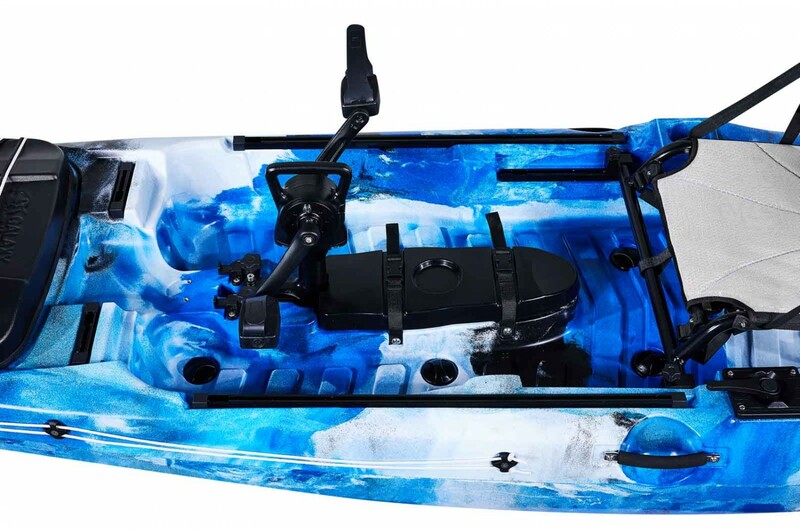 The Cyclone Drive is anchored to the kayak on a front hinge that allows you to lift it in and out of the water comfortably. 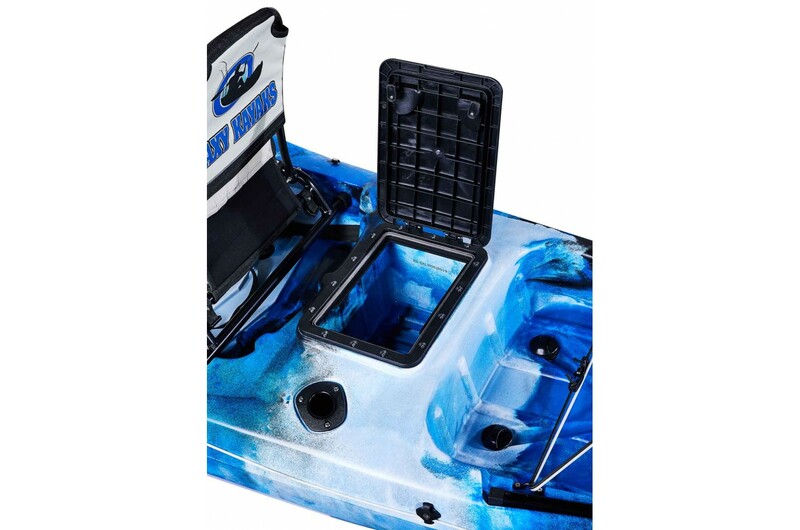 You can put the pedal hatch back on when its out of the water to rest it in place comfortable. 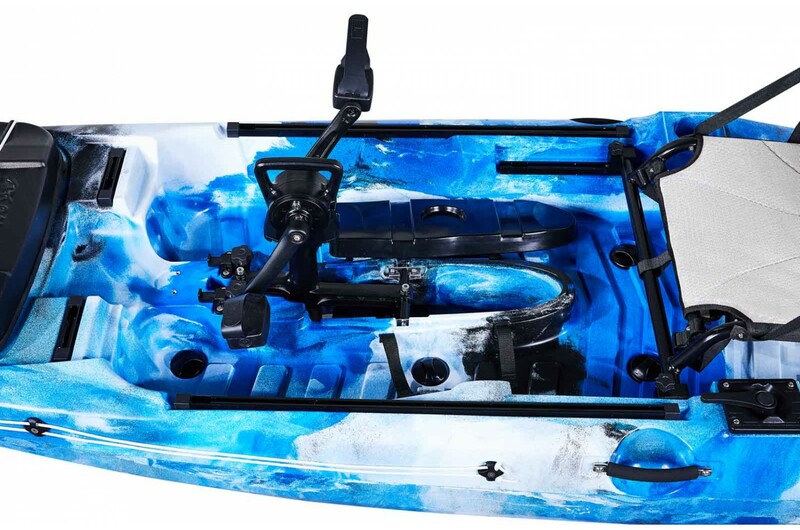 The rear arm comes with two locks so you can fasten the pedal to the hull when its in the water and secure it when pedalling.